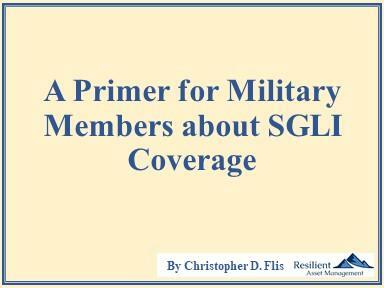 For many Military Members, SGLI is a well-known term. Most understand the basic life insurance qualities of the product. However, there is much more to the program than that. Some of the nuances associated with the product are critical to a Servicemember’s Estate Planning. The Servicemembers' Group Life Insurance program was born in 1965 under Public Law Public Law 89-214. The United States Government recognized the need for life insurance during World War I – a time when military service carried a much higher probability of death than it does today. Insurance actuaries are exceptionally capable at assessing longevity amongst a large group of people where combat losses are excluded. For Insurance Companies considering war fighters at the time, the actuarial problem was quite different obviously and extremely difficult to figure out. Therefore, the United States Government decided to supplement premiums paid for similar term life insurance offered in the private sector, and thus the SGLI program was born. Uncle Sam's decision resulted in affordable coverage for military members and a fair deal for the insurance company providing the coverage. Insurance Company? Yes, you should know that SGLI coverage is administered through the VA with actual coverage provided by the Prudential Life Insurance Company. Yes, that Prudential – the one publicly traded on the New York Stock Exchange (NYSE: PRU). Prudential's OSGLI (Office of SGLI) is in Trenton, New Jersey. For Navy folks, your Navy Casualty office in Millington, TN works directly with OSGLI on a frequent basis....each service handles the SGLI Program differently. These rates are independent of any underwriting factor. Thus, any eligible member considering coverage will pay the same rate. This quality is of considerable importance to anyone who might be otherwise uninsurable. In the table above, there is a column labeled “TSGLI Premium”. I will talk more about this coverage later in the article. For servicemembers who are married to non-servicemembers, Family SGLI (FSGLI) provides $100,000 of coverage for the civilian spouse. If you are married to another servicemember, you must apply for FSGLI coverage via SOES, so please make sure to do this if you are dual-military. Additionally, each Servicemember’s dependent child automatically has $10,000 of life insurance coverage as part of the overall coverage. This coverage includes legally adopted children; stepchildren of the Servicemember’s household; and unmarried children aged 18-23 pursuing higher education at an approved educational institution. Children who “became permanently incapable of self-support before age 18” are also covered. And finally, unborn children who either achieved a fetal weight of 350 grams or 20 weeks of gestation are also covered. Suffice it to say, nearly anyone meeting the definition of “child” is covered under SGLI. Personal administration of one’s SGLI coverage was made considerably easier as the military has transitioned to SOES – the SGLI On-Line Enrollment System. While an on-line system does transfer more of the administrative burden to the servicemember, it also avoids infrequent administrative blunders (lost paper, illegible facsimile, unwitnessed beneficiary designations) that can wreak havoc after one’s passing. The Beneficiary Designation is one of the more important items anyone with SGLI Coverage will want make doubly sure he/she has exactly right. The properly executed Beneficiary Designation governs the payout of the death benefit after death. This designation overrides any declarations made in a Will, Divorce Decree, or most any other document. Given its importance, Beneficiary Designations should be checked at least annually and updated immediately if any errors exist. When designating a beneficiary, it is advisable to complete all the necessary information on the form. While claims can be paid with incomplete information - why take the chance? If the Beneficiary portion is left blank, your State's laws will govern the distribution of the death benefit. Choosing to leave the beneficiary blank is NOT advised. It is permissible to name a Minor Beneficiary. However, Death Benefit proceeds cannot be paid directly to a Minor. Therefore, a Trust or UGMA/UTMA Account must be established by a Custodian who will manage the funds on the Child's behalf. Otherwise, the funds may be withheld until the Minor reaches the age of majority - typically 18, though there are exceptions. Moreover, a Guardian may need to go to court to gain "Conservatorship" over the Minor. A single parent has much to account for in his/her estate planning. As part of a detailed overall plan, it is recommended to account for the use of SGLI and other insurance proceeds for the Minor's care after a parental demise. Thus, establishing the legal instruments (Trust or UTMA/UGMA Account) necessary to accept insurance proceeds should be a top priority for single parents. In addition to SGLI Coverage, which most Military Members have, the military also provides a Death Gratuity of $100,000. A completely independent program from SGLI, the Death Gratuity was introduced after the 9/11 Disaster and has remained as a benefit to Servicemembers to this day. While similar to an insurance policy, there are some subtle differences. First, the coverage is only provided for Military Members, not spouses. Second, Beneficiaries are designated on-line via the Record of Emergency Data / Dependency Application (RED/DA). Third, while designations can be made to whomever the covered individual selects, with the Death Gratuity, if a married Servicemember elects anyone other than his/her spouse, the service will notify the spouse in writing of the election. This caveat does not apply to SGLI Beneficiary elections. And lastly, after a Servicemember's passing, the Death Gratuity payout is generally processed very quickly - typically within 24-72 hours - as all that is required for payout is a death notification report and a properly executed Death Gratuity beneficiary designation. This is an important point to note as many Servicemembers' families tend to rely on each paycheck for regular living expenses. When a Servicemember passes away, regular pay and allowances essentially stop. Therefore, for married Servicemembers, the Death Gratuity is critical to both pay normal expenses and also those costs associated with the Servicemember's passing. A Servicemember designates her spouse to receive the SGLI payout and her parents to receive the Death Gratuity...an election made with the worthy intention of providing $400,000 to her spouse and $100,000 to her parents. Upon her hypothetical passing, her pay and allowances immediately cease. So in this example, the spouse may have to wait for the SGLI payout, which can be subject to delays, especially if a Death Certificate is not issued in a timely manner. During this waiting period, car payments, mortgage payments, tuition bills, etc. continue unabated, which could lead to a cashflow crunch for the surviving spouse. Meanwhile, the Servicemember's parents quickly receive the $100,000 Death Gratuity payout. While the solution may seem obvious as to what the parents could do, frequently it doesn't quite work that way...I speak from first-hand experience. Therefore, for married Servicemembers, strongly consider leaving the Death Gratuity to your spouse, especially if you have minor children. If you must leave money to others besides your spouse and children, please do so with SGLI proceeds. Divorce. For Servicemembers who have gone through divorce, it is critical to update SGLI Beneficiary Designations after settlement. Designations should comply with both divorce decree directives as well as the personal wishes of the insured. From first-hand experience again, this does not always happen, so for leaders with divorcees under their charge, a polite suggestion to update SGLI and Death Gratuity recipients is suggested. There is little a Service Casualty Office or Unit Commander can do when a properly executed Beneficiary Designation has an ex-spouse's name on it. Payouts. Only two choices are available - (i) Lump Sum; and (ii) Installments over a 36-month period. This election is likely dependent upon the financial responsibility of the beneficiary(ies). In practice, the Lump Sum is elected more than installments. Specific recommendations would depend on the individual circumstances of the insured. Accelerated Benefit Option. This benefit permits terminally-ill Servicemembers to receive a portion of the Death Benefit before passing. Servicemembers may claim up to 50% or the Death Benefit in $5,000 increments so long as a Doctor has provided a written prognosis of 9 months or less to live. VGLI Conversion. For those leaving military service, via retirement or otherwise, Veterans Group Life Insurance may be an option for you. The coverage amounts are the same - maximum of $400,000; however, the premiums are substantially higher as they are based on age. If you apply within 240 days of leaving the service, there is no underwriting. However, you are eligible to apply up to 1 year, and 120 days from separation. Outside the 240-day no underwriting window, the applicant must submit to underwriting. If you need Life Insurance coverage and there is ANY doubt regarding insurability, you should consider securing VGLI coverage while going through underwriting with other insurers. If you secure alternate coverage for a lesser premium, you can always cancel VGLI coverage. A lesser know coverage of SGLI it TSGLI ("t-sig-lee" in Navy Casualty's parlance). 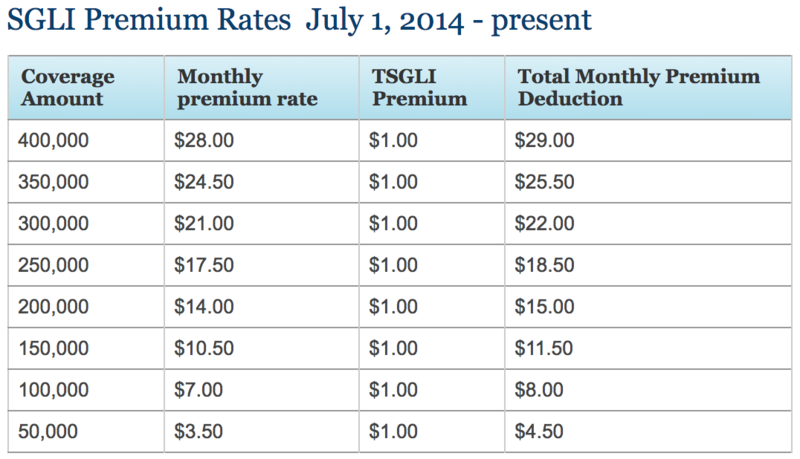 Part of the SGLI premium - exactly $1 - goes to TSGLI coverage. The intent of this program is to provide short-term financial assistance to severely injured Servicemembers and to assist them in their recovery from traumatic injuries. This coverage is not only for combat injuries. For a "Schedule of Losses", please look here. Each service handles the TSGLI program differently. That said, every Servicemember should know the coverages they have should they need to invoke them. If there is any chance you have been injured, you can always make a TSGLI claim. Obviously, not every claim results in a payout. However, no payout is possible without a claim. Of note, any TSGLI payout does not effect the Death Benefit should a Servicemember pass away having received a TSGLI payment. All things considered, SGLI is a very good deal. True, for the youngest and healthiest Servicemembers, alternate insurance may allow some modest cost savings. However, no term life insurance policy will have SGLI's robust coverage - TSGLI being the prime example with FSGLI a close second. For this reason, it is strongly recommended that Servicemembers have at least the minimum SGLI coverage - $50,000 for $4.50 per month...everyone ought to be able to find $4.50 in a spending plan. This article is not intended to be a single-source, all inclusive missive on SGLI. Rather, I wanted to highlight some aspects of the program that are significant to a wide swath of the Servicemembers who have coverage. If anyone is in doubt regarding SGLI coverage, you should seek counsel from your Service's SGLI experts to answer your questions.